Echinocereus amoenus var. aguirre hort. Echinopsis pulchella var. rosea Labour. 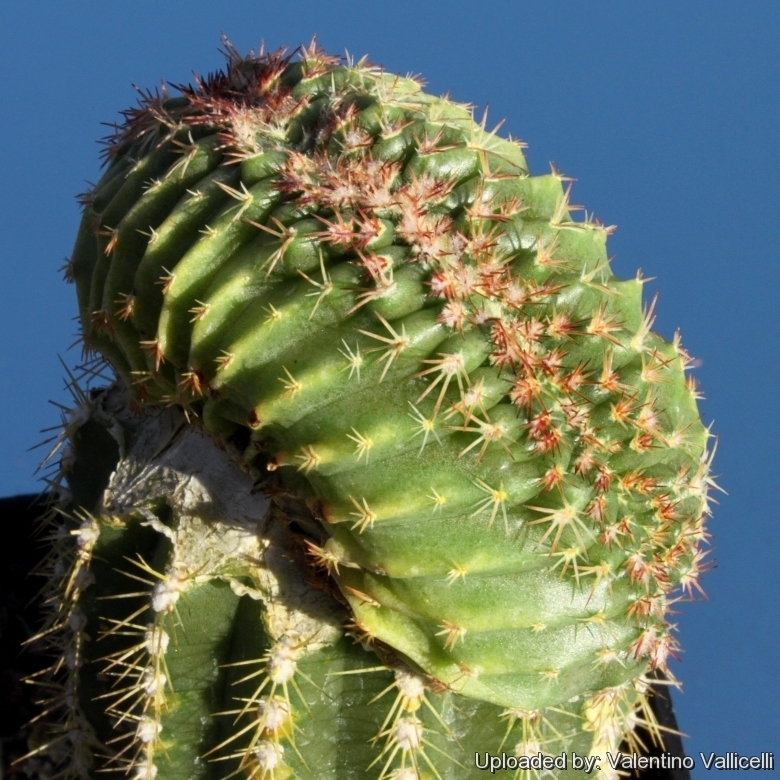 Description: It is a popular solitary or slowly clumping cactus, the standard form of it with flat globular, bluish green stems up to 6 cm, 5-7cm in diameter is very common in cultivation, while the crested form here described is very rare and sometime visible only in specialized collections. Spines: To 7 pale yellowish spines. Root: It has a strong taproot. Flowers: Abundant pink or purple/red (rarely white) flowers, up to 6 cm in diameter. Echinocereus aguirrei Glass: Small Clumper that produces great pink flower (same as: Echinocereus pulchellus var. amoenus?). Echinocereus pulchellus (Mart.) C.F.Först. ex F.Seitz: (subsp. pulchellus) has stems that are 2,5-5 cm thick with 9 to 12 ribs and 3 to 7 inconspicuous spines per areole. The flowers are pink or white. Distribution: Oaxaca, Puebla, Hidalgo, and Queretaro. Echinocereus pulchellus subs. acanthosetus (S.Arias & U.Guzmán) N.P.Taylor: has stems that are 2 to 4cm thick with 9 ribs usually and 5 to 8 flailing hairlike spines. The flowers are magenta to white. Distribution: Oaxaca. Echinocereus pulchellus var. amoenus (A.Dietr.) H.P.Kelsey & Dayton: It has 15 cm stems, 10 to 14 ribs and on the young areoles it has 6 to 8 short spines with the lower spine being the longest. The older areoles are devoid of spines. The flowers are magenta. Echinocereus pulchellus f. cristatus: It is a nice crestes form with bluish green stems. Echinocereus pulchellus subs. sharpii (N.P.Taylor) N.P.Taylor: It has darker colored stems in comparison to the other subspecies. Bodies 2 to 6 cm thick with 11 to 17 ribs and 7 to 14 spines per areole. The flowers are magenta or more often white. Distribution: Nuevo Leon and San Luis Potosi. Echinocereus pulchellus subs. venustus W.Blum & W.Rischer: has low greyish-green body and pink flowers from the lower part of the body. Flower up to 30 mm long and 50-55 mm across. Distribution: San Luis Potosi City to Aguascalientes. Echinocereus pulchellus subs. weinbergii (Weing.) N.P.Taylor: It has stems that are 5 to 15 cm thick with 14 or 15 ribs and 8 to 11 spines per areole. It has pink diurnal flower. The petals are narrowly acute in shape. Distribution: Zacatecas.